Situated on the most easterly edge of Canada, Newfoundland and Labrador have over 29,000 km of ocean coastline. No wonder this province is well-known for its iceberg viewing, whale watching, kayaking, rafting, diving, fishing, and boating! There are many activities and reasons that may prompt you pack your tall rubber boots when travelling through Newfoundland and Labrador. One such activity that occurs right around this time of year is the cranberry harvest. Cranberry production is a recent addition to the agricultural scene of Newfoundland and Labrador, which only started back in the late 1990s. Since then, commercialization has allowed for the expansion of more private farms. In 2014, funding was announced to further develop the cranberry industry in Newfoundland and Labrador with the intent to continue to help diversify the economy and create jobs. Cranberries are truly a Canadian berry. These ruby red gems, also referred to as “marsh apples”, are native to the Atlantic provinces where they can be found growing in the wild. They have become a distinct farming entity within Canada, as our country is the second largest cranberry producer in the world, right behind our American neighbours to the south. These berries prefer wet soggy soil – hence the term “cranberry bog” used to describe the growing 'field' that is used to produce the crop. Harvesting cranberries occurs around this time of year in early to mid-autumn by two different methods. If you haven’t seen a cranberry harvest before, I encourage you to look at one of the many videos online like this one (Newfoundland harvest) or this one (by Ocean Spray). I like to root for the underdog and typically cranberries don’t receive the same attention as other berries do. There are many fantastic reasons why we should include them in our diet and I will give you an appetizer with just three of those reasons. Cranberries contain high concentrations of bioactive compound called proanthocyanidins (PACs for short). 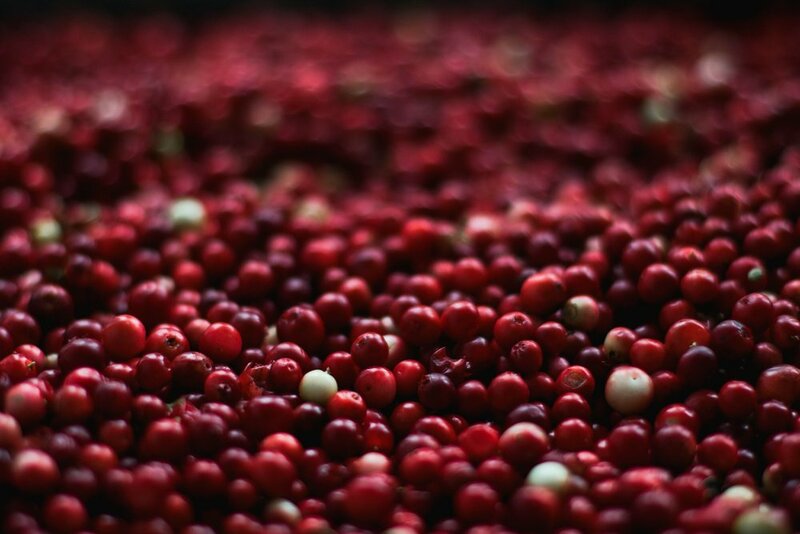 This compound in cranberries is specifically known for its unique anti-adhesion or anti-stick properties that prevents bacteria like E.Coli from sticking to human urinary tract cells. At this point we still don’t know how much we need to eat or how many cranberry extract pills we need to take to effectively prevent a urinary tract infection (UTI) but in the meantime, we know that it is certainly not harmful to increase our consumption, especially if you are prone to UTIs. There is some early-stage evidence (i.e. petri dish studies) that cranberries have a favourable effect on cardiovascular health, including blood pressure, blood cholesterol, glucose metabolism (or the breakdown of sugars in our body) and endothelial function (or the tissue that lines the blood vessels). Stay tuned as we hopefully find out more with human clinical trials to see whether this effect has significant applications to cardiovascular outcomes. 3) Phytonutrients ... aka, they're just darn healthy! Cranberries have many other phytonutrients that are known to have antioxidant, anti-inflammatory and anti-cancer properties. This, as well being loaded with vitamin C and fiber are many great reasons to start including them in your diet. If you're like me, you may wonder how to use cranberries beyond the typical cranberry sauce we often have with special occasion holiday meals like Christmas and Thanksgiving, so I have come up with a few ideas about how to use them in a few different ways. Enjoy! Switch up your traditional overly sweet punch recipe with a lighter more refreshing non-alcoholic appetizer drink. (Save the indulgence for the dessert table instead)! Chill the cranberry juice and carbonated water. When ready to serve, combine the cranberry juice and carbonated water in a pitcher or punch bowl. Ideal ratio is 2/3 carbonated water to 1/3 cranberry juice (or half and half if you want a sweeter tasting spritzer). Throw in a handful of frozen cranberries for colour and to keep the beverage cold. Kale tends to be forgotten once the summer growing season is over in Canada but it is available throughout the year and the upcoming holiday season is a great time to reintroduce it on the Thanksgiving or Christmas buffet table. Wash kale and de-rib by cutting down on either side to remove the thick woody stem, saving only the leaves. Chop leaves into bite-sized pieces and combine in mixing bowl. Set aside. Combine all dressing ingredients in a small glass jar and shake to combine. Pour dressing over kale and refrigerate overnight. This helps to soften the kale leaves. (This step is optional). Prior to serving, sprinkle dried cranberries, goat cheese and toasted slivered almonds on top of the salad and serve. (Note that the amounts for the dried cranberries, goat cheese and slivered almonds are approximate - feel free to add as little or as many as you wish. That's the great thing about salads ... no measuring required)! Apple crisp on its own, although comforting and delicious, is seriously lacking in colour! Try this apple cranberry crisp recipe is inspired by Canadian self-trained chef and food photographer, Angela Liddon, from her first cookbook, Oh She Glows. Preheat oven to 375 F. Grease a 9 x 11 inch baking dish and set aside. Combine the apple filling ingredients (apples, cranberries, sugar and cinnamon) in a medium-sized mixing bowl. Toss well to ensure the fruit is coated in the sugar and cinnamon. Pour into the greased baking dish and distribute evenly. In another medium-sized bowl (re-use the one from the apples to save on dishes) combine the oats, almonds, almond meal, cinnamon and salt. Add the maple syrup and butter to the bowl and stir well. The mixture should resemble crumbs. Sprinkle crumb topping over the apple/cranberry fruit mixture. Cover the baking dish with tin foil and bake in oven for approximately 35 minutes. Remove topping and bake an additional 5-10 minutes until topping is golden brown. Serve warm with ice cream or my favourite, a splash of almond milk. Blumberg, J.B. et al. Cranberries and their bioactive constituents in human health. Adv Nutr 2013, 4:618-632. Jepson RG, Williams G, Craig JC. Cranberries for preventing urinary tract infections. Cochrane Database of Systematic Reviews 2012, Issue 10. Art. No. : CD001321.